This week the team at SHOPPING OUR STASH is "Chipping Away"
For this challenge we'd like you to use something made of chipboard (old collection of chipboard shapes?) OR make your own chipboard embellishment. I have a whackload of chipboard stuff - I bought a bunch of SU chipboard ornament shapes years ago. I made a few things with them when I bought them, but they've been sitting in a drawer in my stash since then. Fortunately the chipboard pieces came with pre-cut design paper in the same shapes. On my project the red background circle, the star and the two pieces under the "Wishful Winter" are all chipboard. I am keeping on with my "make lots of Christmas things in the summer" with this project. I might attach a ribbon on the back to hang it, but I kind of like it just sitting there for now. 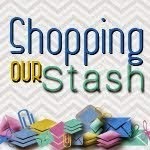 Be sure to visit the SHOPPING OUR STASH BLOG for all the details on this challenge and while you are there be sure to show my teammies some crafty love. Donna, this is just gorgeous and such fun! I love that you staged it outside. Nicely put together! I love reading your posts. My new word learned today is "whackload". I might adopt it. I think I sold or donated all my SU chipboard. I might be sad about that since yours looks so fabby here. Love all the pieces and detail! Awesome possum! Love the pink and green together, and kudos for getting your Christmas on in the middle of summer! I believe that "whackload" and "boatload" have the same meaning! LOL! WTG on getting those Christmas projects done ahead of time! 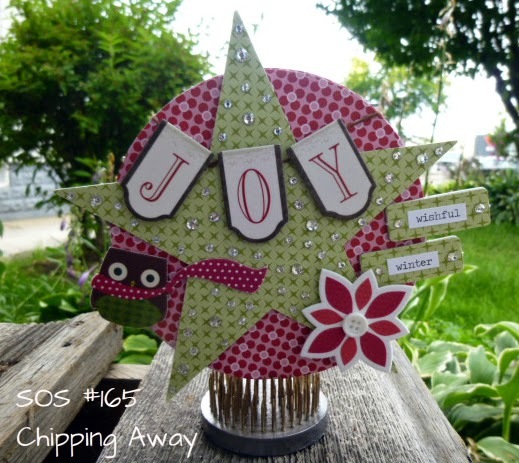 This is SO pretty and what a great way to sparkle things up with stickers and chipboard! NJ!